I have to start this post by saying: I lost the only script to the Nativity MINUTES before the Nativity was supposed to begin. I would have made copies, see, but my printer is out of black ink, and I don’t know where else to get copies within a 10 mile radius of here… I figured we really only needed one anyway, and I kept track of that thing like you wouldn’t believe! Until yesterday, apparently. Thank goodness Bishop had a copy in his office. I felt bad being so undependable -it’s not like me to do things like that. But the show went on despite me. We were able to procure a microphone and speaker, thanks to my loyal music teacher from days gone by, Mr. Hutchens. I got a quick costume together for my daughter which she LOVED… until she got to the park and it was cold. 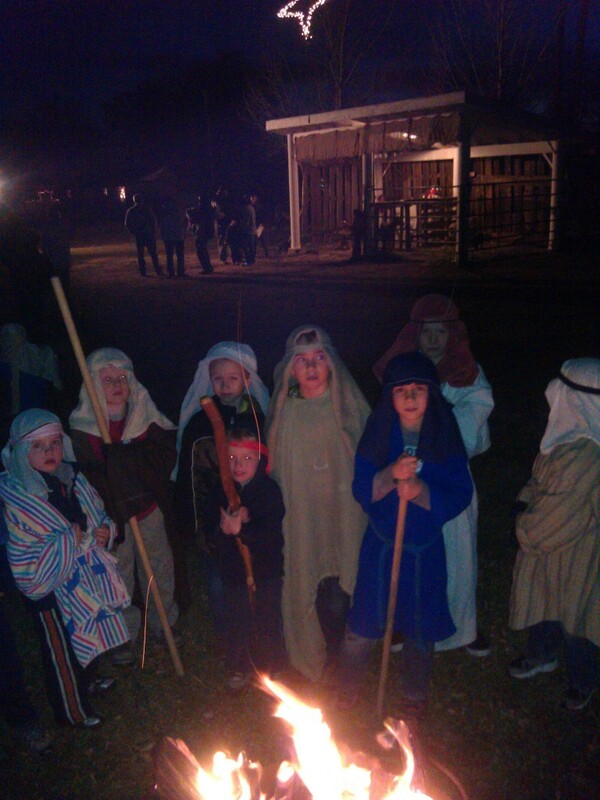 Did I mention that while she was at the cold park, her mother was busy herding Shepherds and making sure the boy wasn’t ridding the manger of hay? “Mom, I’m cold,” she said, looking up at me from under the puffy hood of her big pink coat and clutching her shiny duct tape star in her hands. “I know, baby. Everyone is,” I said, while putting a halo on an angel. “MOM, I’m SO COLD!” She said, this time she had someone’s (who knows who?) blanket wrapped around her legs. “I know, baby. Everyone is,” I said, helping Joseph with his head wrap. “MOMMMMM, I needa go potty!” She said, looking up at me… tears sitting in the corner of her eyes. Other mothers were mothering my children, and I felt guilty about that. The only person who felt worse about it was my daughter. 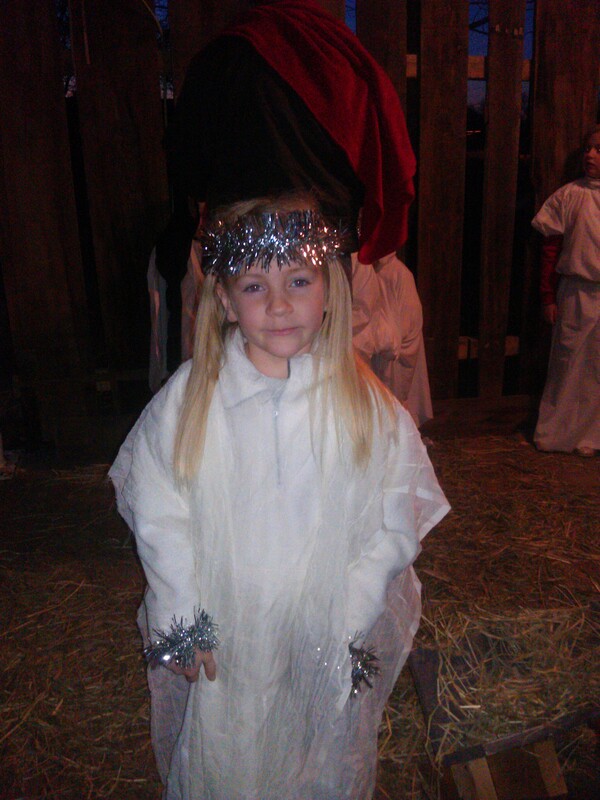 The next time I saw her, she was bawling her eyes out and in the end, she refused to participate in the Nativity. 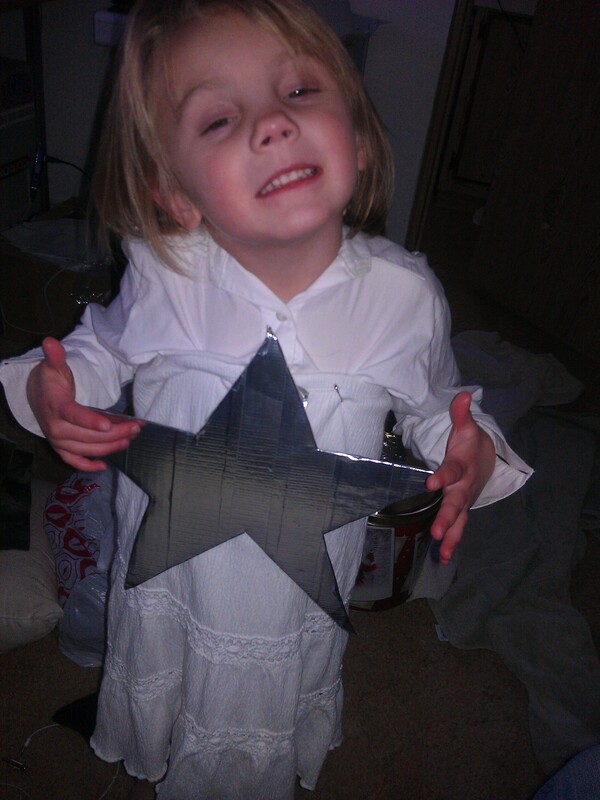 So, like a good mother, I gave her star away to someone who actually wanted it. She was NOT happy with me. The Nativity went on, and my daughter sat in one of our red camping chairs, still completely wrapped up in someone else’s blanket. She had also acquired my mother’s white sweatshirt, and she wore that on top of everything else. 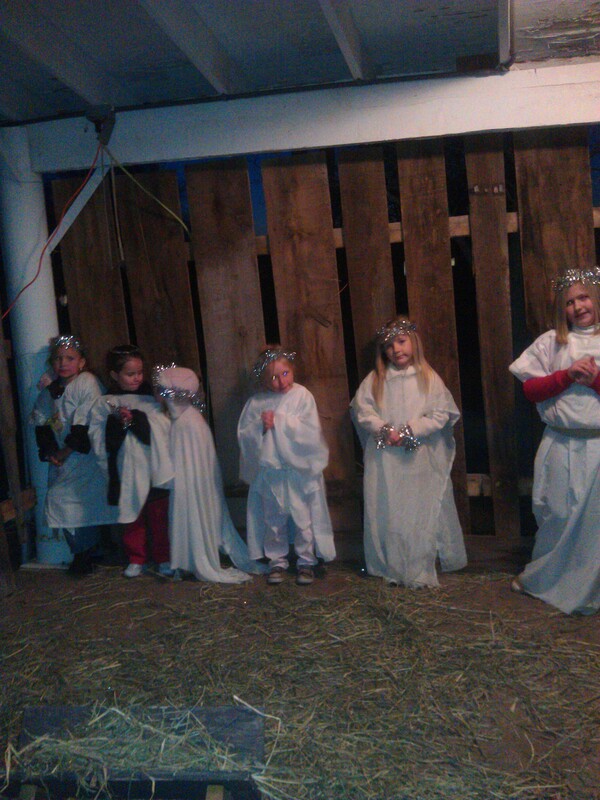 Was my daughter colder than anyone there? I don’t think so. Was she upset that I was stressed? Yeah, I think that was more or less it. The show went on despite our little dramas. My niece was an angel, and isn’t she beautiful? The eldest of the angels was my cousin, Jill. I love being a part of a program that lets me bump shoulders with my cousins, nieces, AND children. The one with the crown isn’t, but we love him just as much. 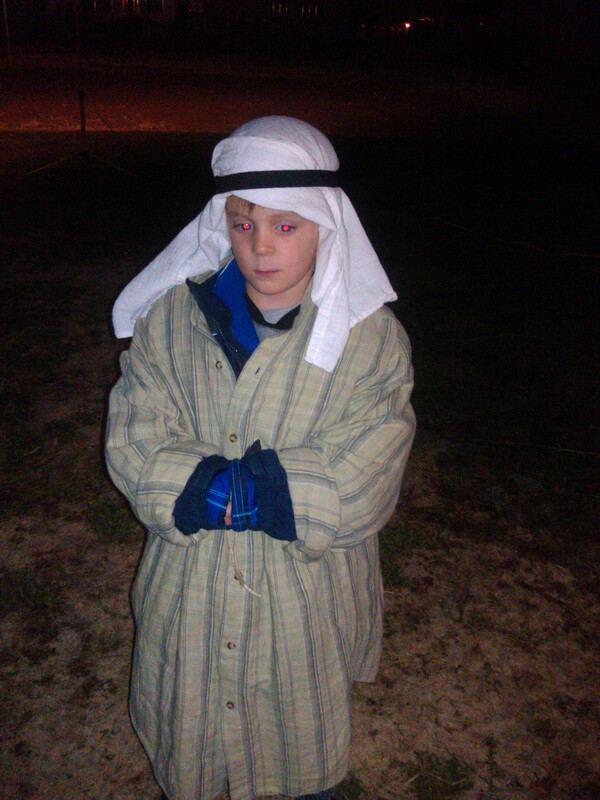 And here’s my cousin Seth… the puffiest and warmest and cutest Shepherd of them all. 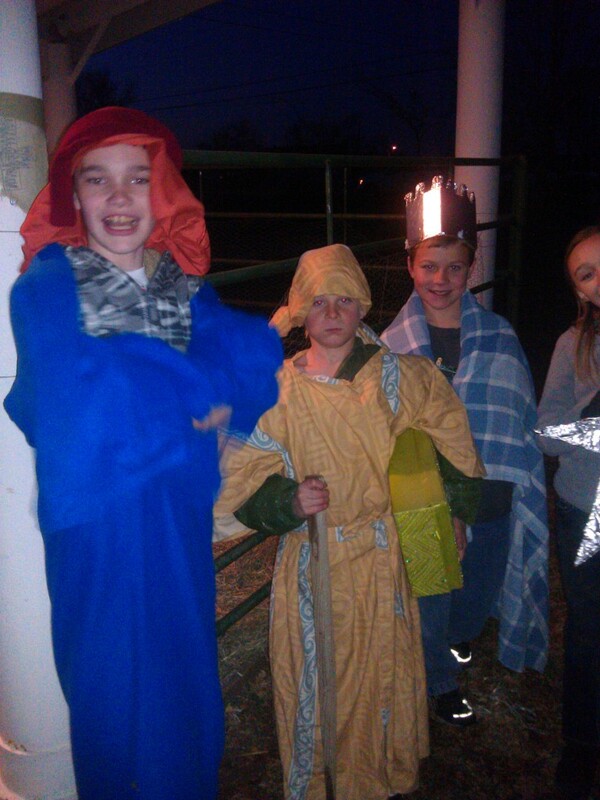 I realized this morning when I was editing this picture that both Mary and Joseph are my piano students. 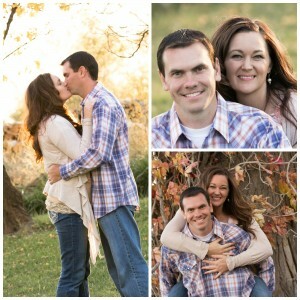 I tried not to pick favorites, and I honestly didn’t realize BOTH of them were my students until just now. In truth, I didn’t pick them out alone. The Primary Presidency all picked out the different parts, and we gave every child the chance to be in the Nativity somehow. 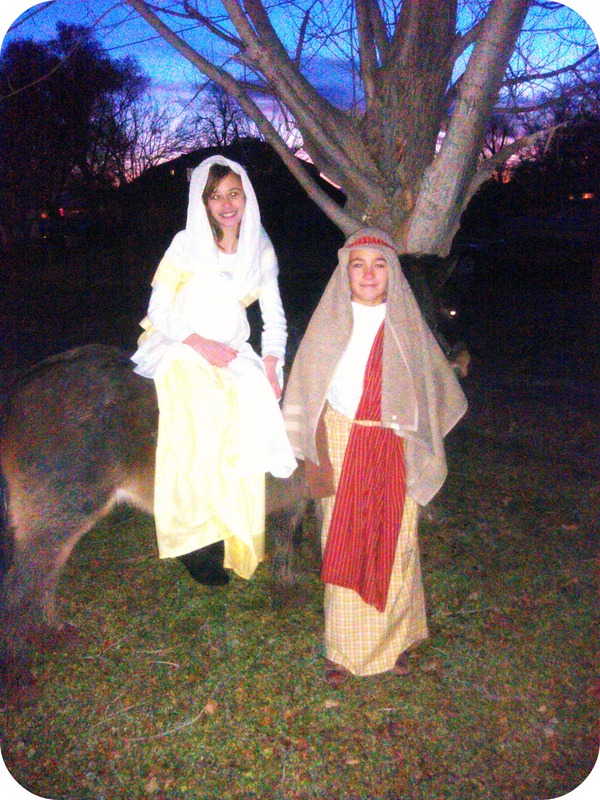 Mary rode on a real donkey -props to her! Unfortunately, I can’t find my camera -we went out of town this weekend, and I know it’s SOMEWHERE but I don’t know exactly where. I used pictures taken from my cell phone. I wish they were better, but they don’t do the program justice. Hopefully I’ll have some better ones soon. The kids did a great job -whether they were narrating, herding, giggling, climbing the stall walls… they were cute. One of our narrators -my cousin, Leigh -proudly read us all about “Castor Agustus” and it just made me smile.